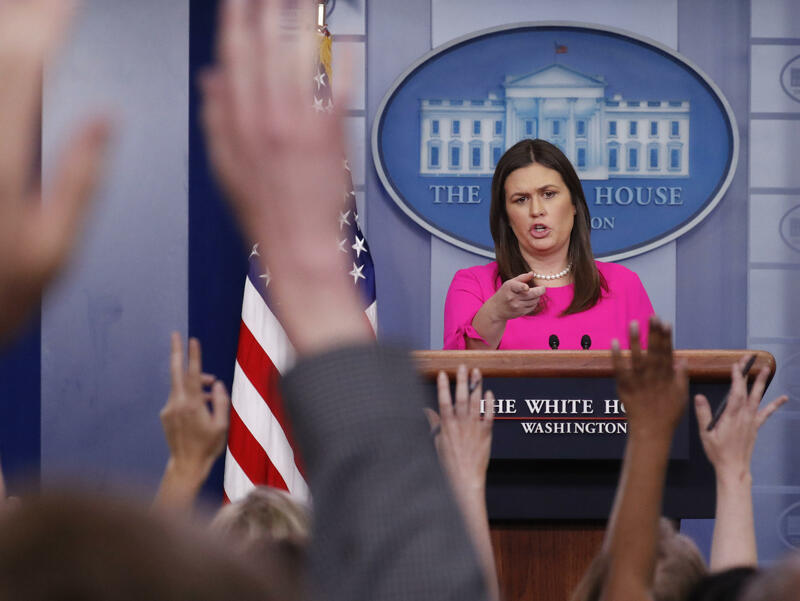 "Healthy debate on ideas and political philosophy is important, but the calls for harassment and push for any Trump supporter to avoid the public is unacceptable," Sanders told reporters at the top of Monday's White House press briefing. "America is a great country and our ability to find solutions despite those disagreements is what makes us unique." The Shenandoah Valley farm-to-table restaurant asked Sanders and her family to leave because she works for President Trump, who called the restaurant "filthy" for showing her the door. "The Red Hen Restaurant should focus more on cleaning its filthy canopies, doors and windows (badly needs a paint job) rather than refusing to serve a fine person like Sarah Huckabee Sanders," Mr. Trump tweeted. "I always had a rule, if a restaurant is dirty on the outside, it is dirty on the inside!" The president has not eaten at a restaurant not owned or licensed by the Trump Organization in the United States since his election, according to records kept by CBS News' Mark Knoller. The Sanders party was in the middle of the cheese course when owner Stephanie Wilkinson asked Sanders to leave. Sanders offered to pay, but Wikinson told The Washington Post that the appetizer was on the house. In spite of the uproar caused by the incident, Wilkinson told the Post she does not regret her decision. "I would have done the same thing again," she said. "We just felt there are moments in time when people need to live their convictions. This appeared to be one." Saturday morning, Sanders tweeted about the incident. "Last night I was told by the owner of Red Hen in Lexington, VA to leave because I work for @POTUS and I politely left," she said. "Her actions say far more about her than about me. I always do my best to treat people, including those I disagree with, respectfully and will continue to do so." The story went viral on social media and Yelp saw a spike in reviews for the Red Hen-- both positive and negative, from Anti-Trumpers and Trump supporters, respectively.